Some workers opt out of 401(k)s and other voluntary plans, especially if they receive little or no employer match or tax subsidy. A much more prevalent problem is working for an employer that does not offer a plan in the first place, as 59 percent of Hispanic workers do. 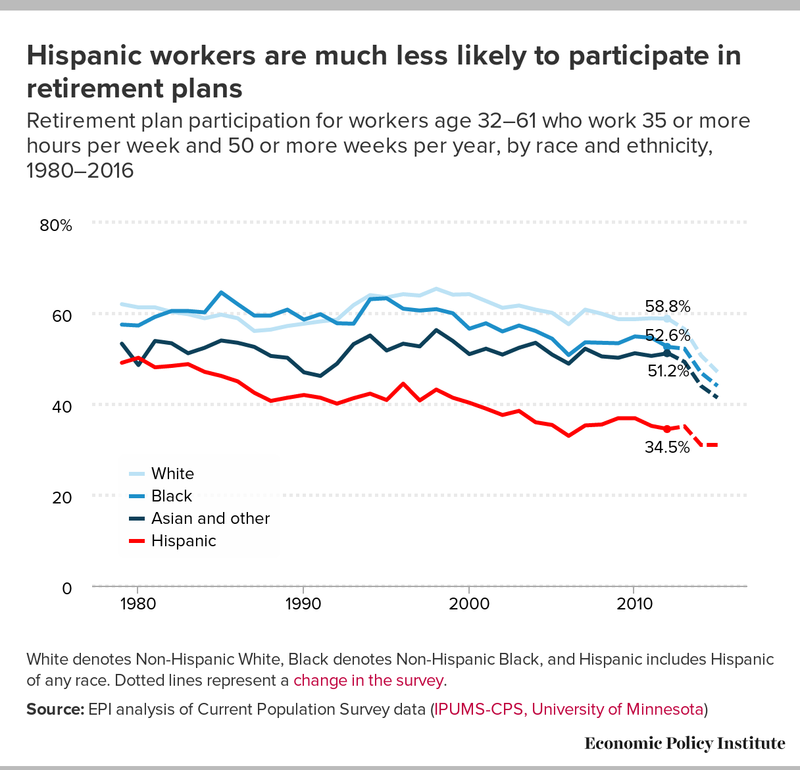 Even if the take-up rate for Hispanic workers were the same as for non-Hispanic white workers, 89 percent of the gap between the two groups would remain. The lack of access to traditional pensions and 401(k)s makes it hard for Hispanics to prepare for retirement and increases their reliance on Social Security and working in old age. Only a quarter of prime-working-age Hispanic families have retirement account savings and the median balance is just $22,000. A new retirement plan in California, where a quarter of Hispanics live, could make a difference. The new California Secure Choice plan will make it easier for workers without employer-based plans to save. Expanding Social Security would make an even bigger difference to Hispanics, who have longer-than-average lifespans. White denotes Non-Hispanic White, Black denotes Non-Hispanic Black, and Hispanic includes Hispanic of any race. Dotted lines represent a change in the survey.